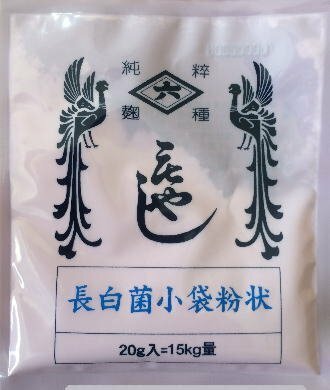 Japanese Koji Kin Rice fermentation starter, original from Japan 20 Grams. Fermented foods are becoming more and more commonplace in restaurants, grocery stores, and even home kitchens. But one that might not be very familiar is koji rice. Maybe that's because it's a fermented food that's hiding inside another fermented food you have in your pantry right now! This starter also can be used to make Mirin, Sake, Soy sauce, Amazake ( Rice Wine), Soy Sauce, Koji Salt, Koji picles, Miso, and many more. What Is Koji Kin Rice? 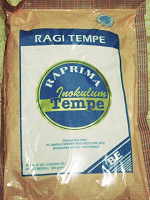 Koji rice is cooked rice that has been inoculated with Aspergillus oryzae, a mold that's widespread in Japan . The mold releases enzymes that ferments the rice by decomposing its carbohydrates and proteins. This process can also be applied to other grains like barley, and legumes like soybeans. To make koji rice, the culture is added to the cooked grains. The grains are then placed in trays and left to ferment in a warm, humid environment for up to 50 hours. The result is essentially moldy rice, but don't be put off by it immediately. What makes koji so special is that it digests starches and proteins and breaks them down into sugars and amino acids. Because of this, it can be used as a starter (aka an ingredient that kickstarts the fermentation process) for a number of fermented Japanese food products, including mirin, sake, soy sauce, and miso. For example, miso is made when koji rice is mixed with cooked soybeans, salt, and water, working it's magic to ferment the soybeans until the mixture is thick, pasty, and that signature blend of sweet, salty, and savory. Ready to incorporate koji rice into your home cooking? Since koji is a major component in so many common Japanese products, you likely have it lurking in your kitchen at this very moment — it lends a depth of flavor to pantry favorites like miso paste and soy sauce. You also can thank koji for passing along health benefits to these products, since it's fermenting them, and fermented foods are said to help boost the immune system and improve digestion. Koji is also used to make shio koji or koji salt, an umami-packed seasoning that's slowly gaining popularity among chefs and home cooks alike. It's made by simply combining koji rice, salt, and water and allowing the mixture to ferment for a couple of weeks at room temperature to become a thick, slightly lumpy paste that's salty and has a light miso flavor. How to use it? The possibilities are endless. It can simply be used as a salt substitute, swapping in two teaspoons of shio koji for every one teaspoon of salt called for in a recipe. It also can be used to marinate meat and fish and pickle vegetables, or as a substitute for soy sauce. Although you can buy shio koji, making it yourself just may be the ultimate way to take DIY fermenting to the next level. Buy a bag of koji rice at an Asian grocery store or online and give it a try.